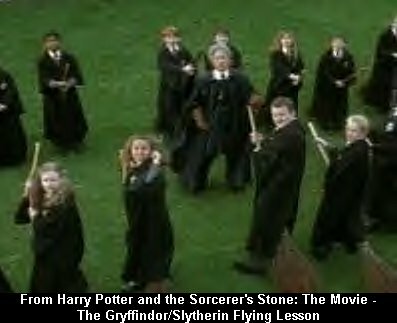 Quidditch, a sport that almost all witches and wizards love taking part in. To really learn more about Quidditch, you may want to pick up Quidditch Through the Ages or Flying With Cannons. Meanwhile, here are the basics to hold you off. 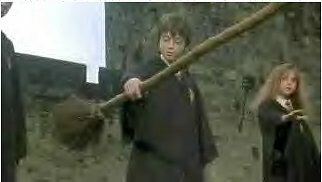 What you must firstly know is that Quidditch is played on broomsticks. It is a lot like muggles sports, though, because the players try to score points. The team with the most wins, like in muggle basketball or soccer (called football in UK. There are are seven players on every quidditch team. Three are chasers, there are two beaters, a keeper, and a seeker. The team needs every single one of these players to win a game. There are also three different balls involved: a quaffle, two bludgers, a snitch. The Chasers are the players that score points. They shoot soccer-sized red balls (called quaffles) into these vertical hoops that are fifty feet high up in the air. Their team gets ten points each time they shoot a quaffle through one of the three nets on their opponent's side. The Keeper plays quite the opposite role. Instead scoring goals, the Keeper guards the goalposts on his or her side, trying to stop opponents froms scoring. Beaters play a very important role. In every game, there are two heavy black balls that whiz around the feild trying to knock players off their brooms. These balls are called bludgers, and it's the Beaters' job to stop them. Beaters are equipped with a large bat and they fly around trying to save their players from bludgers by swatting the balls in the direction of opponents! It takes a lot of strength for Beaters to redirect the bludgers. Last, but most definetly not least, there is the Seeker, the most important and dangerous position in the game (since most fouls are commited against Seekers.) The Seeker's job is to fly above the quidditch feild in search of the golden snitch: a walnut sized gold metal ball with silver wings that appears and dissapears in different places all over the feild. The game can only end when the snitch has been caught, and the seeker that caught the snitch win's his or her team one-hundred-and-fifty. There you have it! You now know how to play the game!